Yeast require oxygen in order to synthesize compounds during growth. The lack of oxygen will therefore become evident if the yeast are put in conditions that with adequate oxygen would produce large amounts of growth. In order to highlight the use of oxygen in these tests a high gravity wort will be used and drastically under pitched. If the free oxygen in hydrogen peroxide can be utilized by the yeast then this should make it evident. The hydrogen peroxide solution at the pharmacy here is 3%. For each molecule of 2(HO) there is one Oxygen molecule that can disassociate. It takes two of them to make oxygen gas. 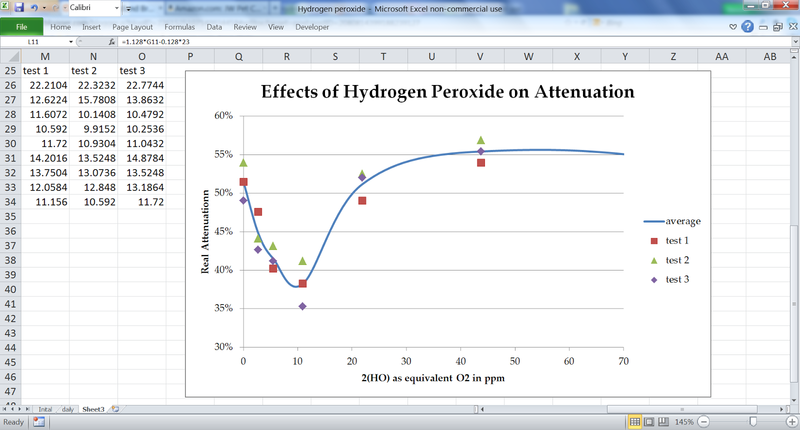 With some molar math this means that the solution available at the drug store is equivalent to a 7000ppm O2 solution. For the tests these will be diluted down to more reasonable amounts of oxygen. 350, 175, 88, 44, 22, 11, 5, 3 and zero will be used. Each test will be done in triplicate. All tubes will be done in triplicate. All of the tubes initial gravity, final gravity and final cell volume will be recorded. A cell count will be conducted on three of the tubes with the lowest volume of cells and three tubes with the highest volume of cells. From this information final cell counts will be derived for all 27 tubes. In addition, daily cell counts will be preformed on two additional tubes. 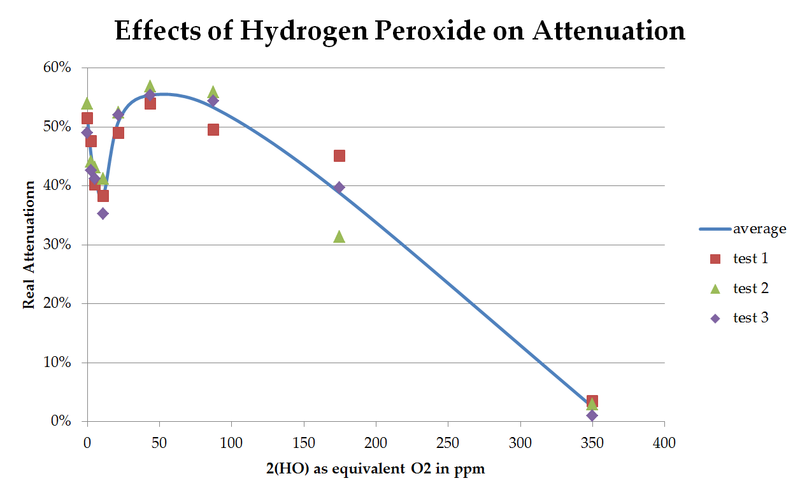 One containing no additional hydrogen peroxide and the other containing the 11ppm oxygen equivalent using hydrogen peroxide. Daily cell count and gravity will be checked. 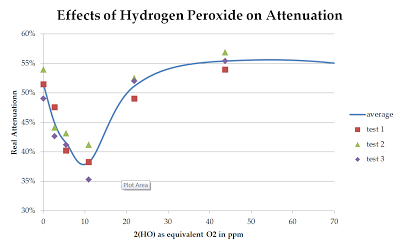 Hydrogen peroxide was effective at adding oxygen to the wort, but did not improve attenuation. 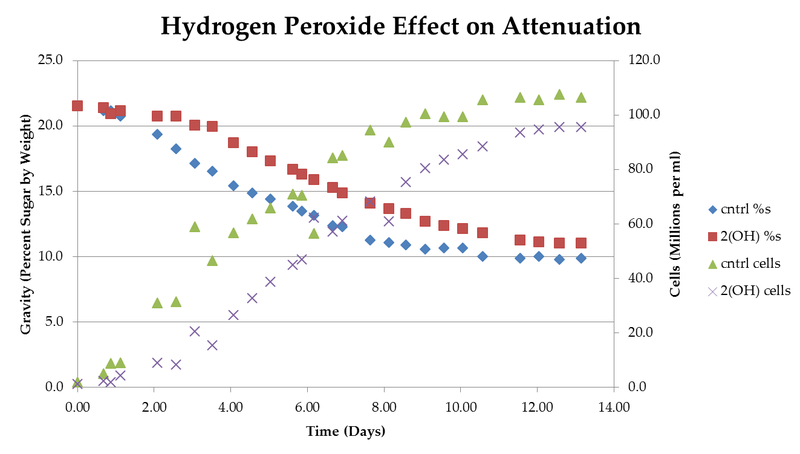 The toxicity of the hydrogen peroxide was detrimental to yeast growth. 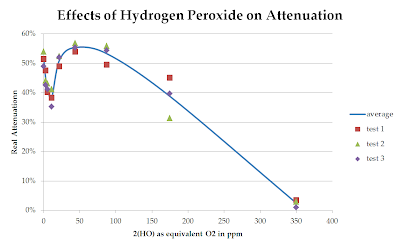 The optimum level was an equivalent of 50ppm of oxygen although at this level the results were similar to adding no oxygen. 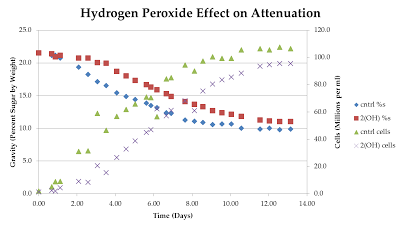 The high gravity wort with low pitch rate took 12 days to complete with and without the added oxygen, although fermentation without added oxygen in the form of hydrogen peroxide was significantly faster.